The Copperheads took their three game weekend opportunity to the fullest, taking first place overall in regular season in the extra tight South division of the HJHL. Three consecutive wins, two on the road, solidified their bid for top spot in the south gaining home advantage with a bye in the first round. The Copperheads 50 pts were tied with the Okotoks Bisons 50 pts, so it came to a tie breaker on regular play between the two adversaries, with the Copperheads coming out on top with five points to the Bisons four. Coaldale had two wins and one overtime/shoot out loss ( 5 pts) while the Bisons had one regulation win and one overtime/shoot out win ( 4 pts). The regular season push started in High River Friday night were the Snakes beat the Flyers 7-4 on the road. The Copperheads came out strong , out shooting and out playing the Flyers in the first period and part way through the second but found themselves down 4-3. A goal tending change put Andrew Suriano between the pipes and the Copperheads rebounded to a 7-4 victory with Suriano stopping all of the twenty remaining shots. Scoring for Coaldale was Levi Anderson, Jayden Smith, Tyler Anderson, Riese Nevil, Ty Abbott, Clay Nevil and Sam Paskuski. Shots were 38-34 for Coaldale. 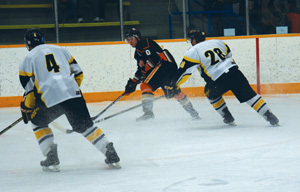 Saturday night at the Snake Pit, the Copperheads pounded the Strathmore Wheatland Kings 8-1. A full house was treated to Fan Appreciation night, and recognition of retiring veteran Captain Calvin Swanson, who scored his 150th regular season career point for the Copperheads that evening. Coaldale native Chase Williamson scored twice with singles from Levi Anderson, Smith, Tyler Anderson, Turner Sharp, Jedd Horvath and Morgan Simpson. Player of the game went to Turner Sharp who had a four point night. Suriano stopped 24 of 25 shots. The Copperheads needed to win Sundays road game in Strathmore to seal up first place, and despite pounding the Strathmore net minder with shot after shot, were only up 1-0 after two periods with a goal from Tyler Anderson. The Copperheads kept up the strong offensive effort and eventually tallied in the third with a goal from Riese Nevil which sealed the win for first place in the South division going into the play offs. Andrew Suriano closed the regular season out with a shut out,turning away all 23 shots, continuing his strong play after being summoned of the bench in Fridays game. Coaldale blistered 41 shots in reply to some sharp Strathmore net minding. First Round best of 3 series — Cochrane Generals (3) vs Medicine Hat Cubs (6); High River Flyers (4) Strathmore (5); Bye for Okotoks Bisons (2nd) and the Coaldale Copperheads( 1st). Second rounds (best of five series) will commence mid next week and will be announced (Feb. 19). The Sunny South News submissions need to be sent in this week, earlier than normal, so fans will need to watch for announcements of the second round on their team web page; Twitter, Facebook, Instagram, Lethbridge Herald and poster/signage around town. One last reminder for home playoff games- season tickets will no longer be available. Cost is set at Adults $10 and Youth $5.